Today I’m feeling equal parts crazed and contemplative. On one hand, this is Christmas week. Between Wednesday and Sunday we have five different Christmas parties in three different cities. Two are on the same day. We’ll spend our time this week in the car, missing nap time, eating too much sugar, and making small talk with relatives. It will be busy, messy, exhausting, and beautiful. On the other hand, 2014 is quickly drawing to a close. It’s been a whirlwind of a year. 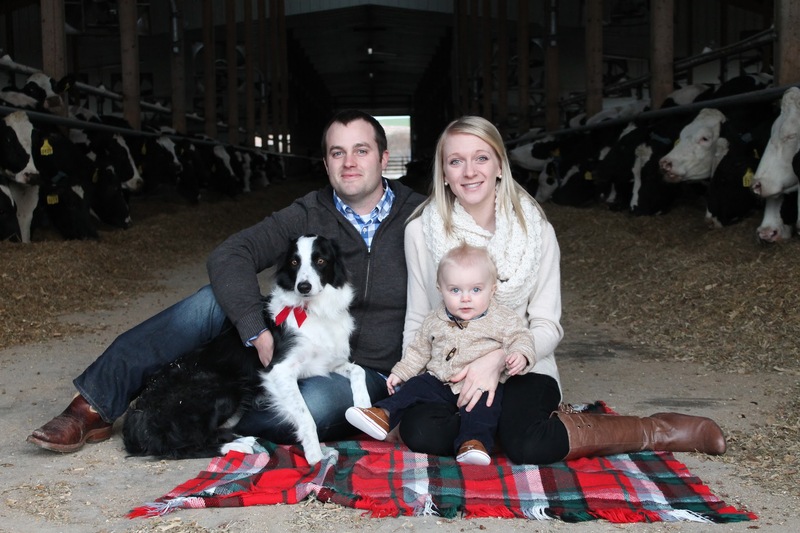 From Anders’ birth to building yet another new barn, we’ve rarely had moments to settle, to be still. We made it through the early days of parenthood and now I have a beautiful, happy son who is somehow crawling, waving, and cutting teeth. Quite a difference from where we were just eight shorts months ago. The swift passage of time is startling. I started 2014 with a growing belly, an unfinished nursery, and raging donut cravings. Life has changed irrevocably, but we are so blessed it hurts my heart. So, in spite of the busyness, the driving, the sugar, I choose joy. 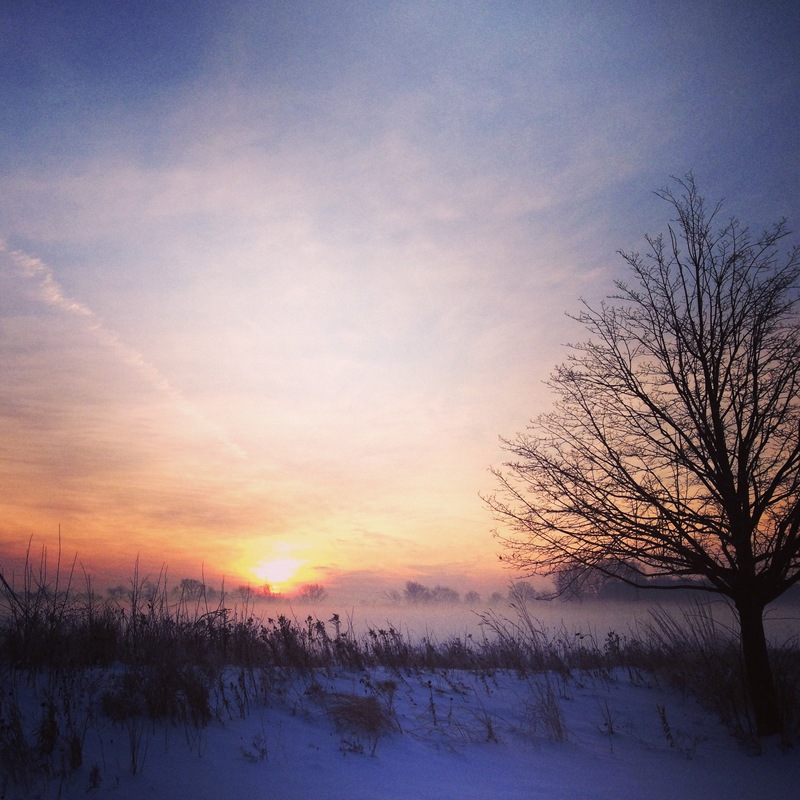 I choose to wrap myself in the promise of Christ’s birth and savor the ordinary moments that form this beautiful life. I wish the same to you, dear friends. Find the calm, bright moments this week and don’t let them go. 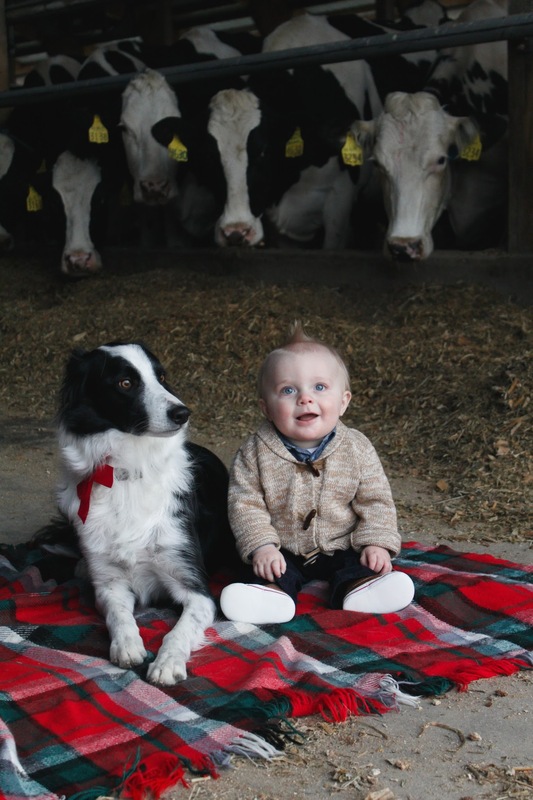 Merry Christmas, from our barn to yours! 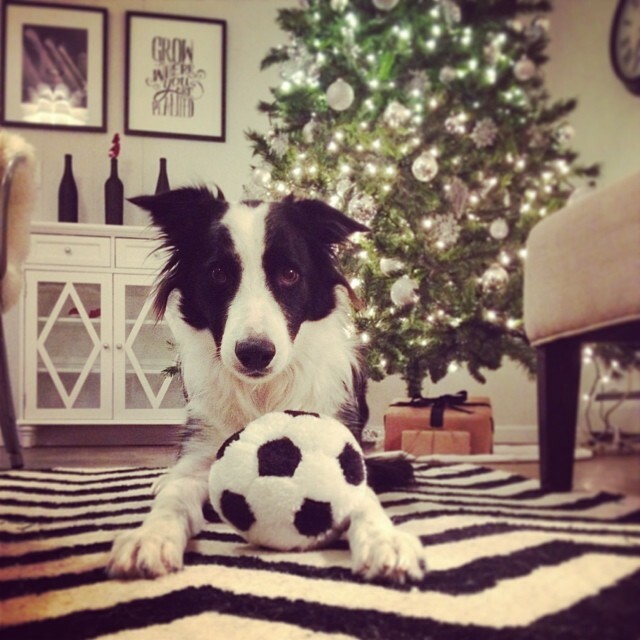 The gifts are unwrapped, the cookies are stale, and it’s time to take down the Christmas decorations. There’s a certain melancholy that comes with the holiday seasons’s end, especially after such a frenzied rush to the finish line. But I feel peace. Dairy Man and I spent some time last night looking through photos from 2013 and it’s been a good year. We’ve accomplished a lot in 12 short months, from building a barn to teaching Jersey to high-five to making a baby. I’ve learned more about patience, persistence, kindness, and creating space for my soul to breathe. Now, we look forward to 2014 with rightful fear and ecstatic joy. That said, I can’t usher in the new year without telling you what I learned this month. 1. Dairy Man doesn’t enjoy ballet. 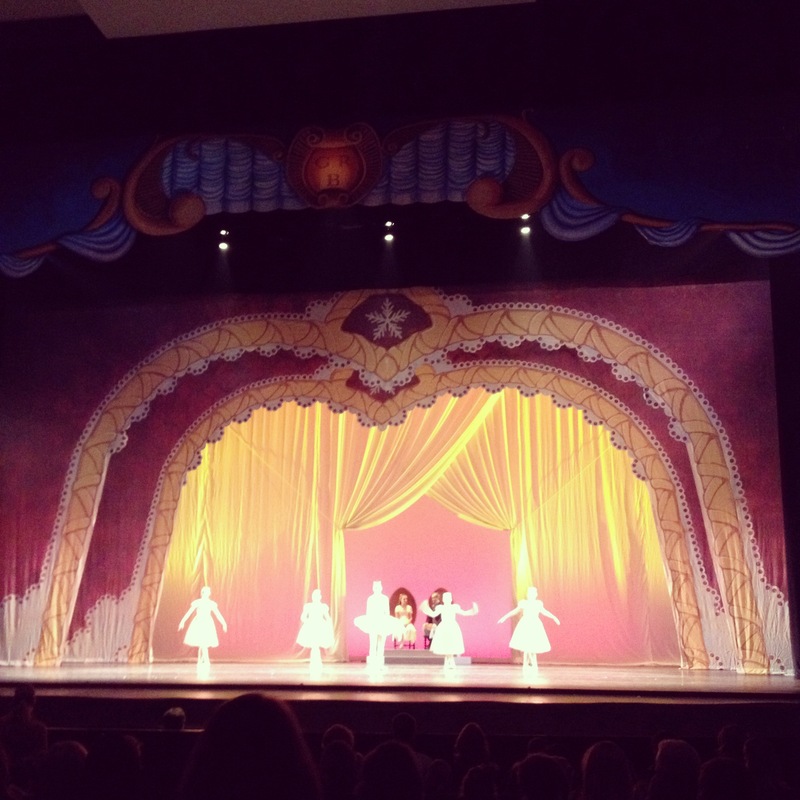 DM and I journeyed into the city this holiday season to see The Nutcracker. I love everything about this classic ballet, but he was skeptical. And now we know. While my dear farmer enjoys plays and musicals (thankfully, because I’m a total theater nerd) he does not enjoy ballet. I think the skintight white pants may have thrown him off. Or perhaps the movements he called “prancing around.” It’s really a shame. 2. Dogs have around 1,700 taste buds. Humans have 9,000. This fact could explain why Jersey has such a propensity for manure consumption. Though maybe I would find it delicious too if I only had 1,700 taste buds. 3. I’m addicted to watching Jersey on the baby-cam. DM got me a baby-cam this summer so that I could watch Jersey on my iPhone during the day. 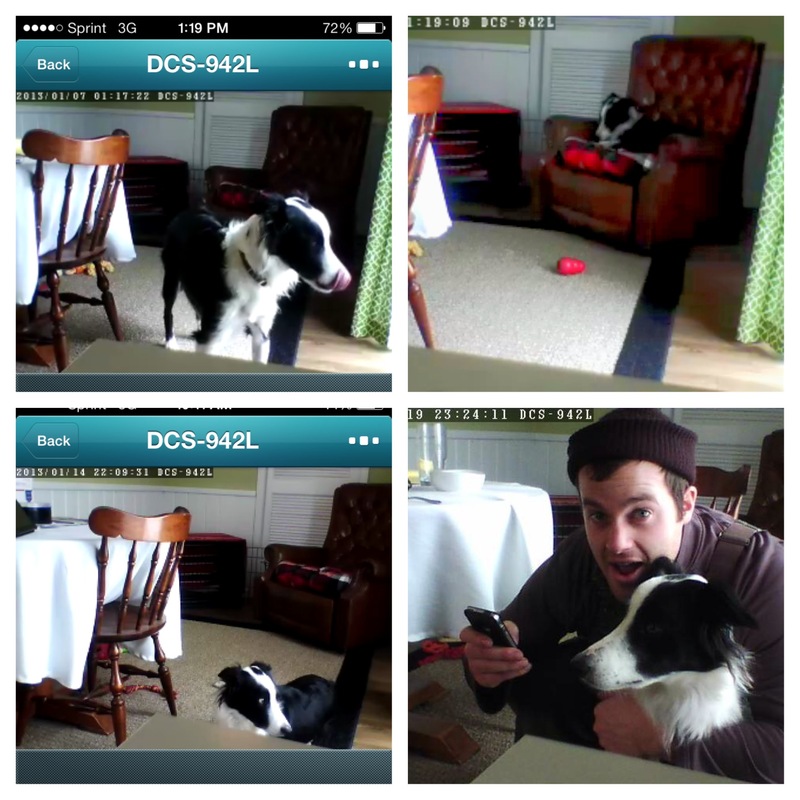 But we didn’t hook up the camera until this month to test it out for the impending Baby F. Even though all Jersey does in the kitchen is look out the window, eat, yawn, and nap, I can’t stop watching him. DM even makes a cameo appearance once and a while. 4. My family is still awesome. Case in point? 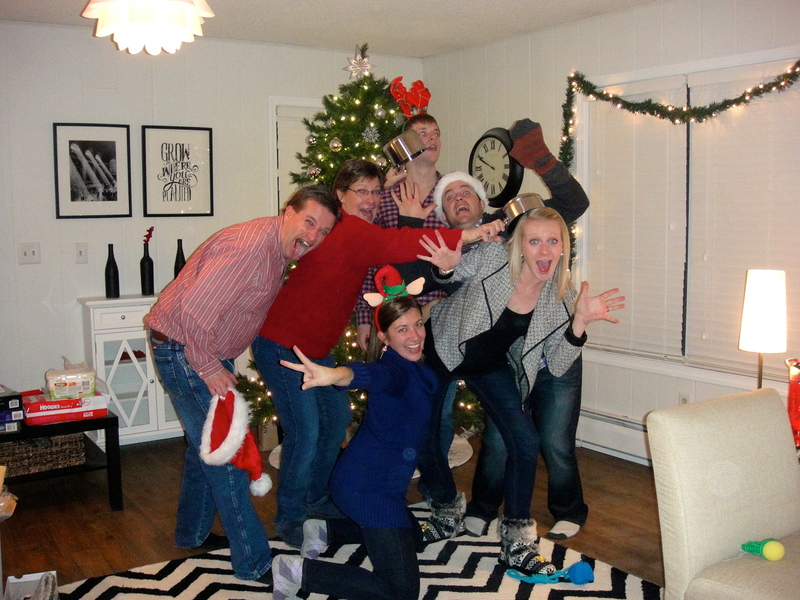 Our annual Christmas card photo shoot was a smashing success. 5. Though eerily similar in look and texture, mashed cauliflower is NOT a viable substitute for mashed potatoes. 6. Everybody loves a pregnant reindeer. 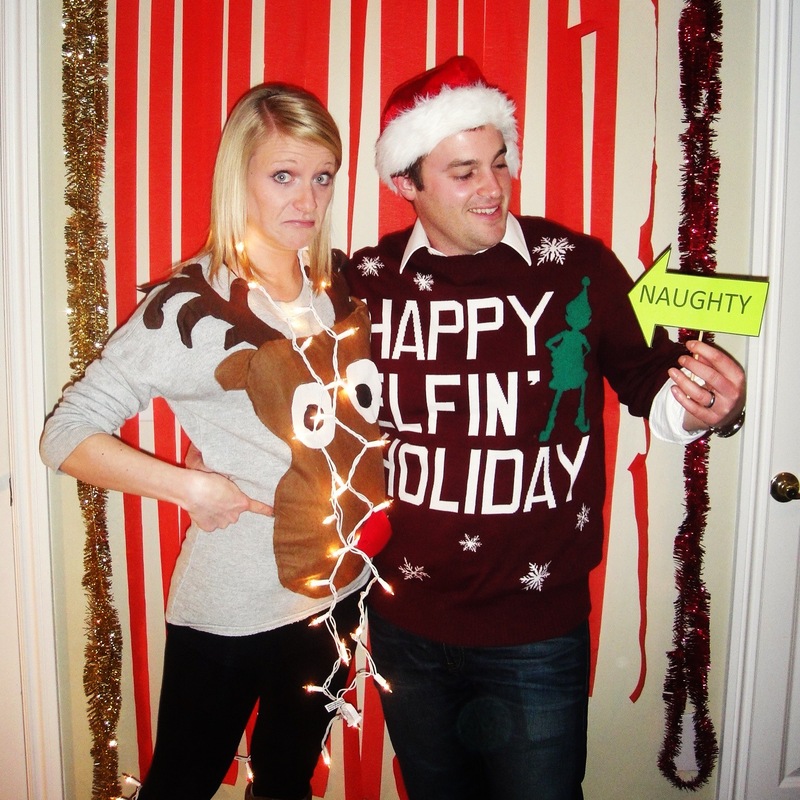 Best entry ever into an ugly sweater contest? Maybe. 7. Baby Boy F is going to have a cousin in July. We were thrilled to find out last week that DM’s sister is also expecting her first child! It will be so fun to have cousins only three months apart. I can almost see the motley crew comprised of of our current dog-children and future farm-kids creating mischief all over the dairy. 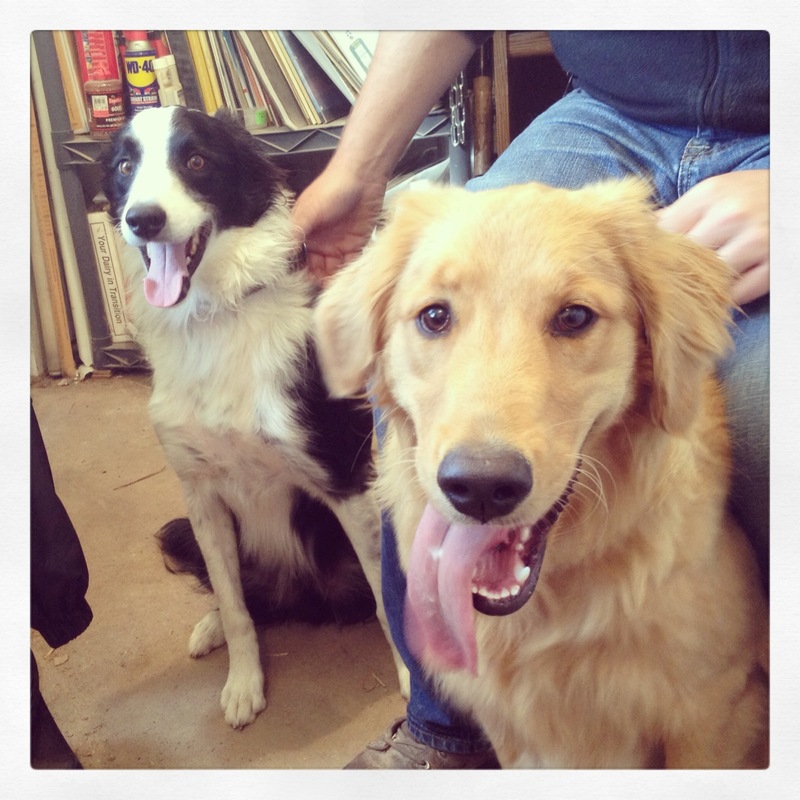 Jersey and Maggie have assured us they are more than up to the task of educating their human protégés. 8. In my favorite Christmas movie, Home Alone, the McAllisters’ house was a real house outside Chicago. Who knew? I wonder if they do tours? 9. Hiring out is the best. When DM and I found out we were pregnant, we decided the only logical place for a nursery was in the wild, untouched frontier known as our upstairs. This decision required some serious renovations, like taking out walls, adding insulation, and stripping off ancient lath and plaster. A project of this scale called for professional help. So, for the first time since we started renovating three years ago, we hired a contractor. And people, let me tell you, it is glorious. 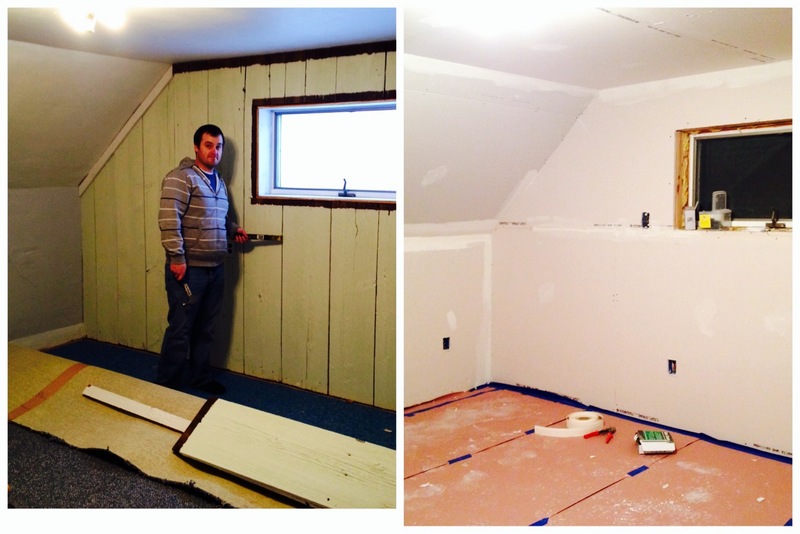 We went from damaged wood paneling and chipped plaster to bright shiny drywall in a matter of two weeks. It’s amazing how quickly things get done when you’re not trying to squeeze it in on a weekend. My nesting instincts are on steroids. 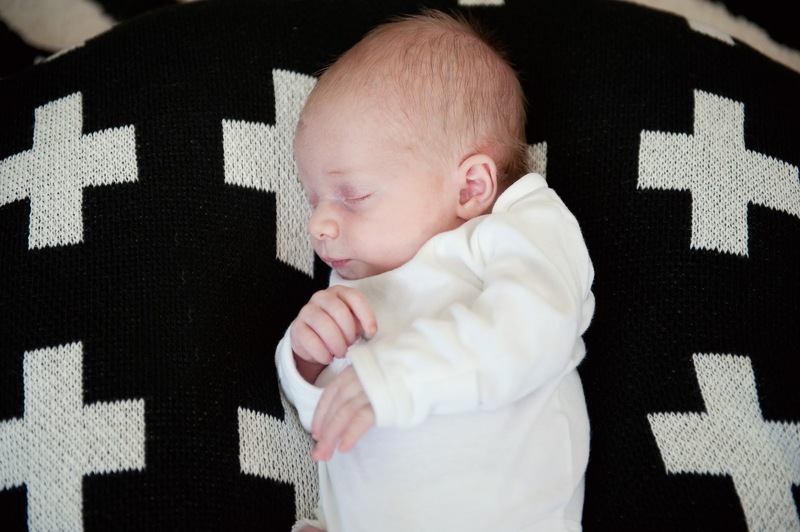 At first I thought I was squeaking through pregnancy without any weird cravings. Pickles and ice cream sounded repugnant and DM wasn’t making any 2 a.m. gas station runs for Flamin’ Hot Cheetos. 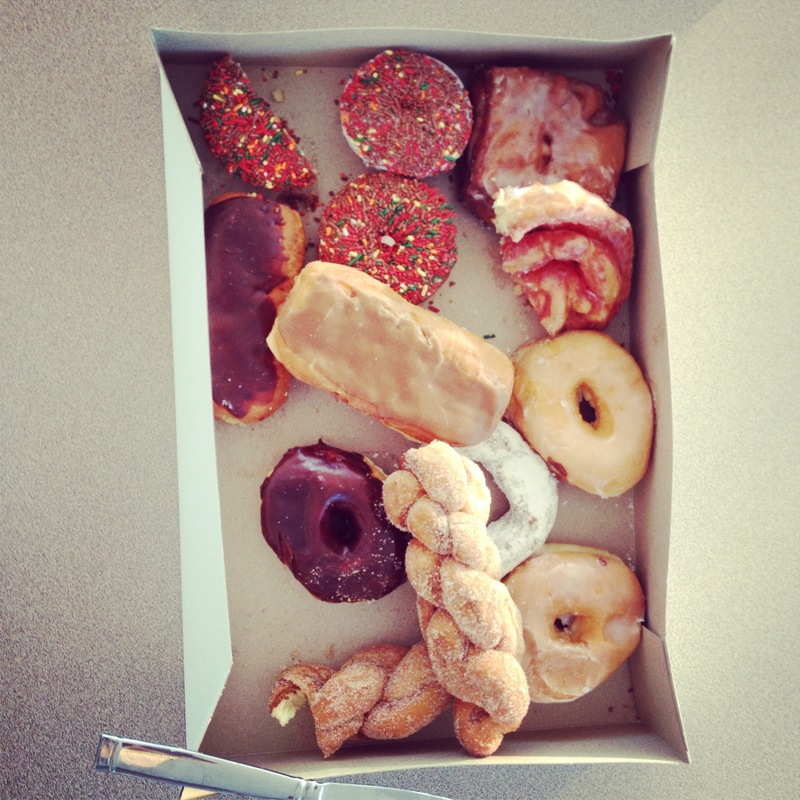 But then I started thinking about donuts and I couldn’t stop. So I’ve started buying them for other people. Because if I’m going into a sugar coma, I’m taking everybody down with me. On this overblown, Hallmark-ed, commercialized day called Valentine’s Day, I like to take a moment to think seriously about the loving relationships that have shaped my life and my own marriage. Despite Dairy Man and I being pretty awesome already (and ever so humble), we have both learned a lot about happy marriages from our parents and grandparents. All of the relationships were different, but each one taught us something important. As you can see, Dairy Man and I come from good-looking stock. And yes, my dad (bottom right) DID have a legendary ’stache on his wedding day. Nearly everything I know about love comes from observing my parents. 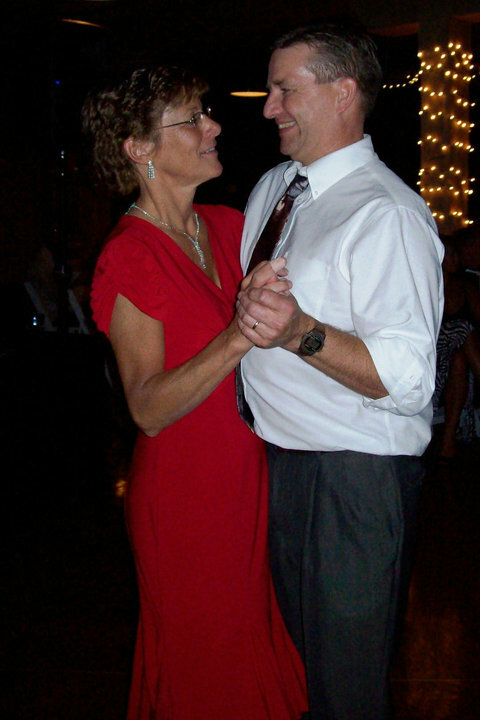 Those crazy kids have a quirky, steadfast love that has stood the test of 33 years. My parents aren’t showy, but it’s impossible not to soak up some marital goodness to apply to my own relationship. So, let’s take a stroll through Dave & Judy Marriage 101. I have absolutely no doubt that my parents love each other. They were free and easy with hugs and kisses in front of us kids (even amidst a chorus of “Eeeeeeeeewwww! !” and my mom swatting my dad away, “Dave, get off me!”) and weren’t afraid to say “I love you.” When Dairy Man and I have a family someday, I want to emulate my parents and make sure to thoroughly mortify and embarrass my children with a little Mom&Dad PDA. My parents are dorks. There are no two ways about it. They make up their own words and phrases (like “sugarjets” and “ookums”), tease, poke, and laugh. They don’t take life too seriously. Sometimes they even wrestle at Christmas. It’s easy to see how my entire family ended up being so weird. My parents do not express love in gifts or extravagant experiences. It’s painful for them to spend money on “frivolous” things like soda at a restaurant or new shoes when the old ones don’t have holes yet. Basically they are good upstanding Dutch folk. Not surprisingly, my mom doesn’t really like flowers: “Why spend good money on something that’s going to die? I’d rather have a puzzle.” One year my dad found a way to get around this. While he was rollerblading, he saw some flowers growing alongside the road. Being the hopeless romantic he is, he plucked a bouquet and bladed it home. My mom was thrilled. Because she got flowers on her anniversary? No. Because my dad hadn’t spent a cent on them. That’s love, people. It’s inevitable that parents will fight in front of their kids at some point. Mine were no different. But I still remember what they would tell us if we witnessed an argument: “Don’t forget, your dad/mom and I might fight, but I want you to know that we love each other very much and will be together forever.” They taught me early on that marriage vows are forever. My parents will be together for better and worse, in sickness and health, for richer for poorer, as long as they live. Over the years, I’ve noticed that the happiest times in my parents’ marriage were often after someone said “I’m sorry.” While there is great delight in being right (my dad and I delight in it just a little too much), it is a far more beautiful, loving act to let things go. If DM and I have a fight, the quickest way to happiness is for someone to let go of the need to be right. 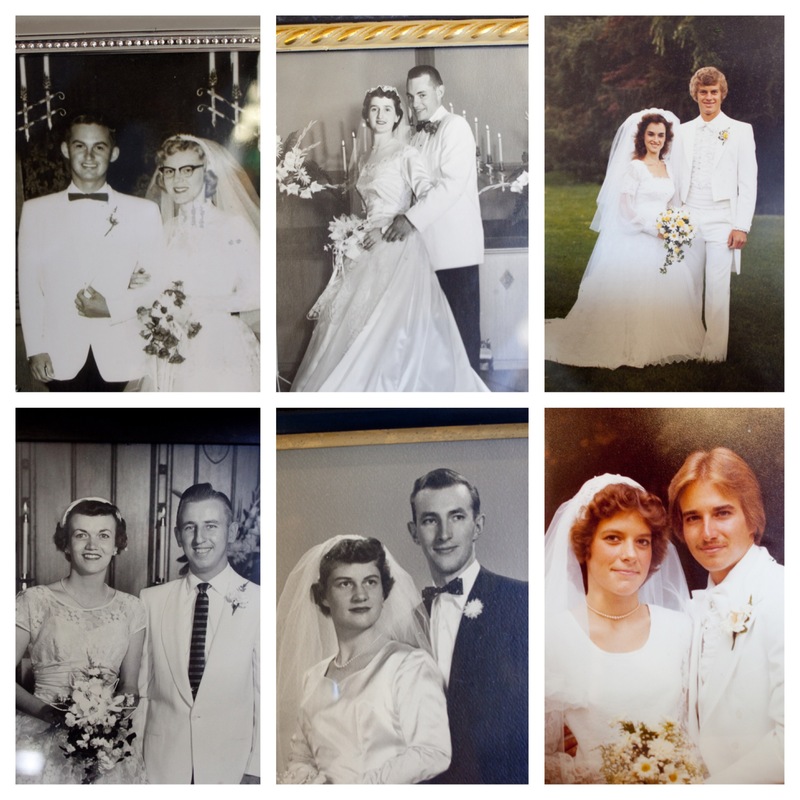 My parents’ marriage is founded on more than respect and love. They’re the first to admit that #5 would be impossible without God’s help. Every step they take as a couple stems from prayer and deep faith. This faith has sustained them through the best and worst that life has to offer. My parents became empty-nesters a few years ago when my little brother went to college. 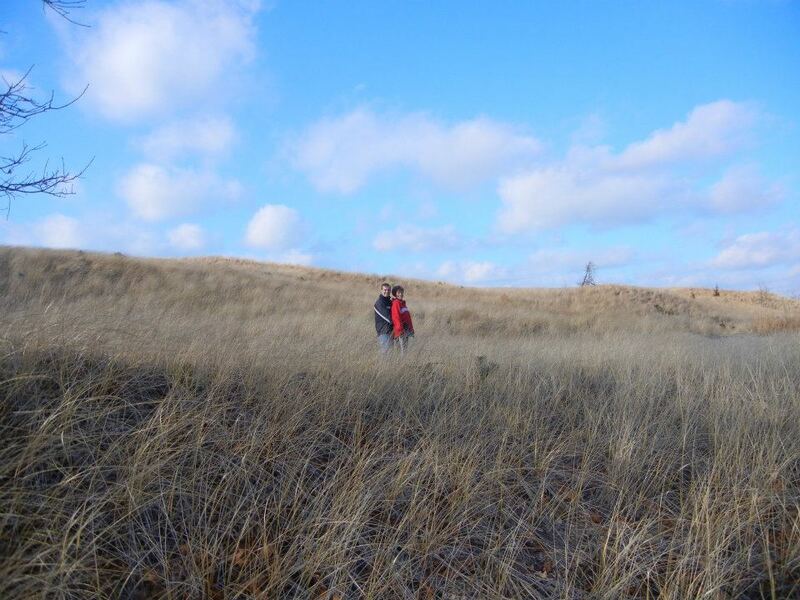 After getting reacquainted in this post-spawn world, they found a mutual love for hiking in the dunes by Lake Michigan. 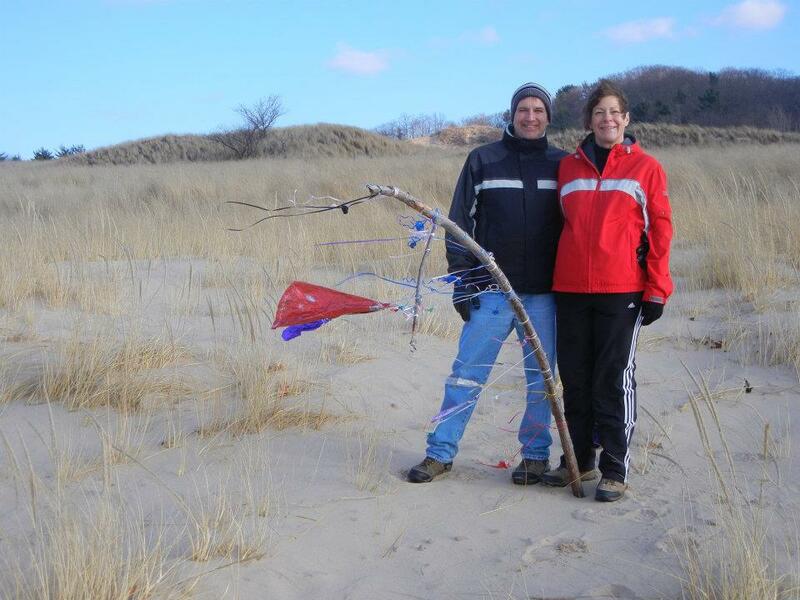 On one of their hikes, my dad stuck a large branch into the sand and tied a ribbon to it. Over many months, my parents added more ribbon and string to the branch. Other hikers did the same. There’s something wonderful and symbolic about this branch. 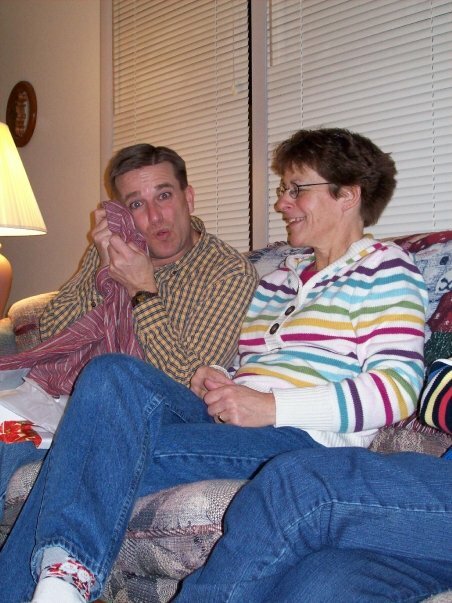 I only hope to have a marriage as full of love and laughter as my parents. Or my in-laws (shout out to Kent and Vonnie) or grandparents (Bill and Shirley; August and Anne; Roy and Gloria; Marv and Virginia), for that matter. Dairy Man and I are surrounded by examples of steadfast, godly love. And that’s something worth celebrating on this day of chalky candy hearts and overpriced roses! So, dear reader, now it’s your turn to share. What have YOU learned about love from your parents, step-parents, or grandparents? We all know that cows can’t sing. Well. They can sing, but their melodious mooing is rarely in tune. Regardless, in the interest of sending you off into the holiday weekend with visions of sugarplum dairies (see what I did there?) dancing in your head, I thought I would let our bovine ladies wrap up the twelve days of Christmas. Thus, a herd of cows, steers, and even a calf or two are here to sing the twelve verses of my little dairy ditty. May you all have a Christmas full of blessings, family, eggnog, and twinkly lights! 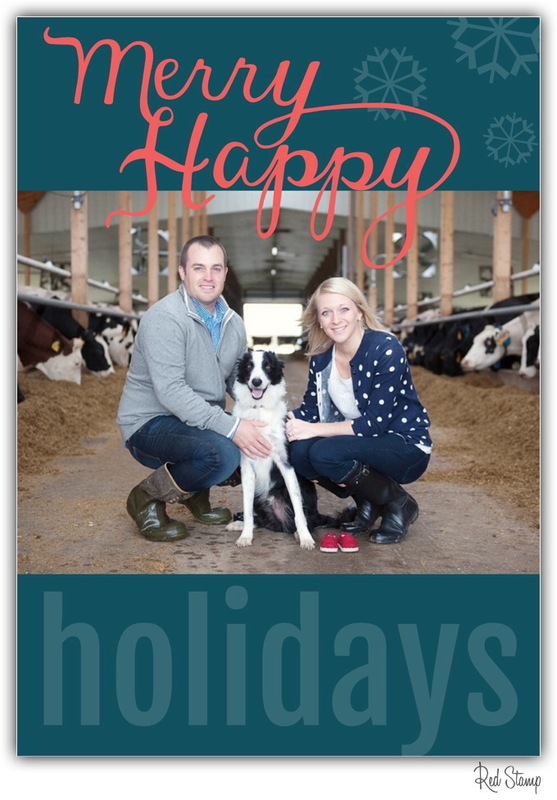 A Dairy Merry Christmas to you and yours! Ps: Fun fact about December 22. Did you know that three years ago today a very nervous boy got down on one knee to ask me to be his wife? It’s been a wild adventure full of love, change, and cows ever since! Love ya, Dairy Man. When we chop corn each year for cow food, DM has two options for storage: ag-bags or silage packs. Ag-bags are easier to seal and maintain; packs are more space efficient. We utilize both methods of storage, but I’m partial to the pack. Maybe it’s because Dairy Man won’t let me climb on the ag-bags. I’m all about storage methods that allow me to scurry around on them like a mountain goat. After we’re done building the pack, we cover it with huge sheets of plastic and thousands of sliced tires. Though I enjoy talking about “sliced tires” and imagining them on a pastrami sandwich on rye, DM would prefer I use their proper name: tire sidewalls. Tire sidewalls are sliced tires used to hold the plastic down on our silage pack, thus preventing oxygen from seeping into the valuable cow food. The slices come from the sides of old semi truck tires. Semi tires suit our purposes better than car tires (or rubber inner tubes, which, I admit, is what I first thought the black circles were when I first saw a silage pack) because they are heavier and cover more surface area per tire. We don’t use full tires because they hold water and are clumsier to handle. The tires are ultimately tied together with bale twine to keep them from sliding down the pack. It also makes a perfect stairway for MFW mountain goats. In addition to creating a delightful farm jungle gym, sidewalls are an effective and cheap way to keep our cow food fresh and tasty throughout the year. Above you’ll see Jersey, chatting it up with ten of our mooing neighbors. I’ve talked before about taking walks with my pup to fill the time spent without the Dairy Man. During the spring, summer, and fall, Jersey the dog and I take a LOT of walks. It’s a wonderful time to get my bearings, to breathe, to appreciate this boondockish place in which I live. There was a time when I didn’t think the country was beautiful. But I officially stand corrected. On these walks, Jersey and I love to stop and say hello to our mooing neighbor ladies. Our neighbor farmer raises beef cows on a few huge, green pastures. The cows (and cute little calves!) are friendly and very curious about the black and white canine furball racing along the fence line. Jersey loves to socialize with the neighbors and I love to stop walking for a second to watch the black and brown cows frolic through the field. It’s an idyllic view. I can barely stop myself from taking a picture every single time. I used to long for a real neighborhood; for human neighbors, sidewalks, streetlights, neighborhood watch, city plows, playgrounds, and playdates. But these wide open spaces and mooing neighbors make life in the country just a little sweeter.